Welcome to Northern Ireland’s leading vehicle air conditioning centre. We have been providing air con service to the public, trade, main dealers and local garages for over 20 years, we have been servicing air conditioning since 1996, when the only cars with AC where top of the range luxury models such as Jaguar & Bentley. Since then almost every car on the road has AC. Having trained at motor climate in Birmingham we believe we are number 1 at providing air conditioning service in Northern Ireland. We work along side Quick Fit AC service centres diagnosing and rectifying AC faults for them as well as a host of car body repair shops and main dealerships. We have 5 AC machines on site so we are never too busy to fit you in for a service. We use top quality machines from Viper, Bosch, Ecotechnics and Texa as well as stand alone AC diagnostic machines for checking compressors and valves. We are also proud to announce the introduction of our new R1234YF gas air conditioning machine. 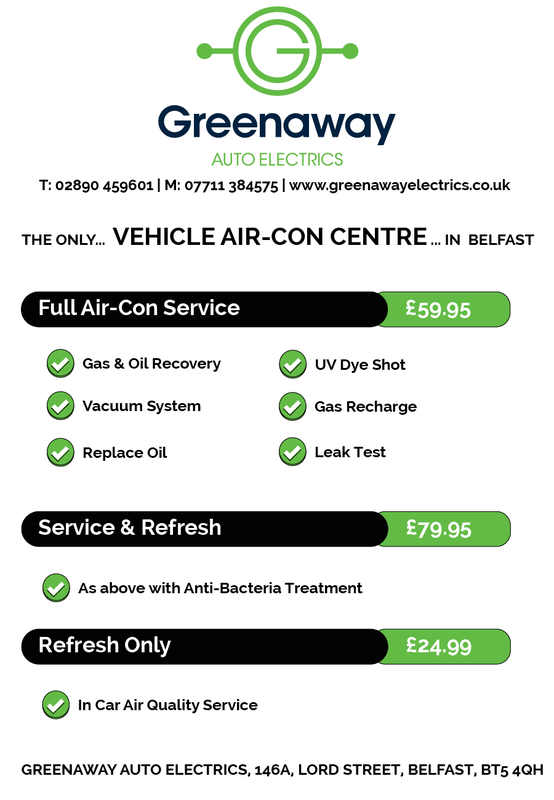 We are undoubtedly the undisputed market leader in vehicle air conditioning technologies in Northern Ireland. There are two basic types of AC system. One that uses an orifice tube and accumulator and one that uses an expansion valve and drier. The latter being most popular. A car AC system is split into two section, high pressure and low pressure. It is a closed loop system that uses the compressor to change from a low pressure gas to a high pressure gas which is then cooled again by the condenser into a high pressure liquid. This liquid is then pushed through the drier which acts like a filter taking any moisture out of the system. It is then transformed through the expansion valve to the vehicles evaporation which is in the interior of the car. This is where the magic happens. The liquid refrigerant that is supplied to the evaporator by the expansion valve expands to a vapour as it absorbs heat from the air and it is this process that removes the heat and moisture from the cabin. So the main function of a car AC system is not cool air in the summer but to create a pleasant and odour free atmosphere in your vehicle at all times. A. 45 minutes to 1 hour. Q. Can it be done while I wait? A. Yes we have 5 machines so it won’t be a problem. Q. How often should it be done? A. AC should be serviced every 2 years but checked once a year as there is a natural leak of 15% gas.